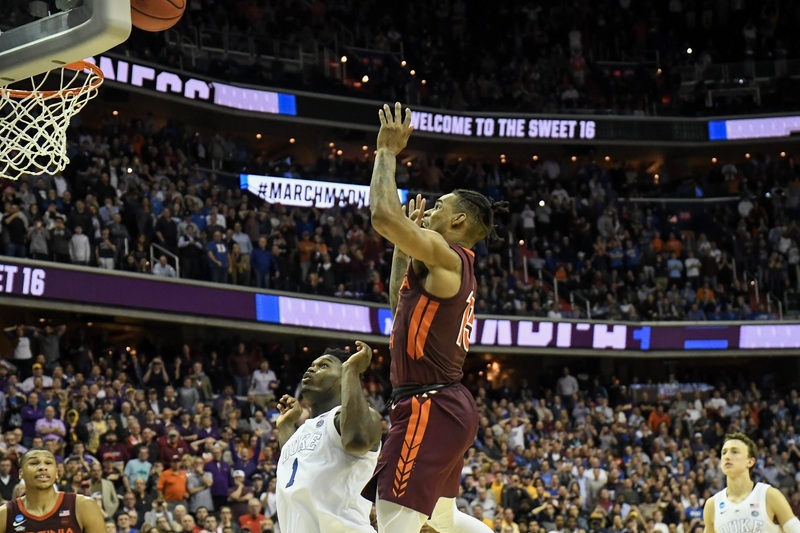 Ahmed Hill missed a point-blank shot off a Justin Robinson alley-oop as time expired, and Duke escaped with a 75-73 win over Virginia Tech in the Sweet 16 at Capital One Arena in Washington, DC. No. 1 seed Duke advances to the Elite Eight, while no. 4 seed Virginia Tech’s season ends at 26-9, the most wins in program history. Hill’s game-ending miss was the third shot the Hokies missed in the last ten seconds. After Duke’s Tre Jones missed the front end of a one and one with 29 seconds left, Virginia Tech got the rebound, and Hill missed a three-pointer with ten seconds to go. Kerry Blackshear corralled the rebound, and Virginia Tech called a timeout with 5.8 seconds to go. The Hokies ran a play for Ty Outlaw, who missed a three-pointer, and Duke knocked the ball out of bounds with 0.6 seconds left on the clock. The officials reviewed the play and set the clock to 1.1 seconds. Robinson inbounded from the right of the basket and threw a lob to Hill, who was cutting across in front of the basket and had an open look at the rim. Hill short-armed the shot and put it to the left side of the rim, where it fell harmlessly into the arms of Duke’s Zion Williamson as the clock expired. The tough ending for Virginia Tech closed out one of the most entertaining games of the Sweet 16. The game featured nine ties and nine lead changes, with seven of the lead changes coming in the second half. Virginia Tech was not intimidated by the opponent or the magnitude of the game, hitting five of their first six shots to take a 15-9 lead. The Hokies led for 15:58 of the first half and trailed only briefly, for 1:18 of the half. Virginia Tech was up 38-34 at half time after ending the half on a 14-6 run. In that first half, the Hokies shot 45% and made seven three-pointers, while Duke shot 52% and hit 4-of-11 three-pointers. 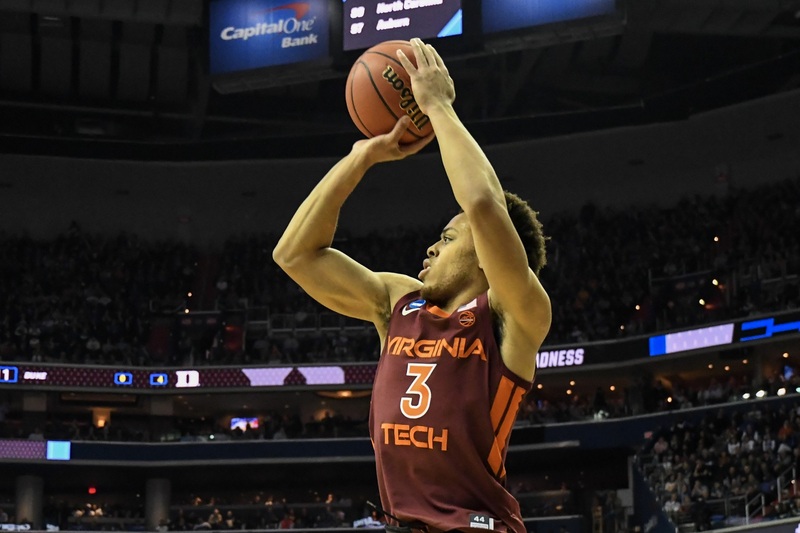 Hill had 13 points in the half, and Virginia Tech got a surprise contribution from Wabissa Bede, who was Tech’s second-leading scorer in the half with ten points. The second half was a different story. Duke blistered the nets for 17-of-29 shooting (59%) after the break, while the Hokies only made 12-of-33 shots (36%). Duke outscored Virginia Tech 26-14 over the first 11:15 of the second half, opening up a 60-52 lead with 8:45 remaining. The Hokies gradually clawed their way back into it, closing Duke’s lead to 66-64 on a three-pointer by Nickeil Alexander-Walker with 5:11 to go. The two teams traded buckets to make it 68-66, and then Tre Jones hit a three-pointer with 3:51 left to put the Blue Devils up 71-66. Alexander-Walker missed a three-pointer about 30 seconds later, and a Zion Williamson dunk put Duke up 73-66 with 3:01 remaining. Williamson’s dunk was Duke’s last field goal of the game, but the Hokies were unable to take advantage of Duke’s scoring drought from the field. The Hokies were hurt by an uncharacteristically good three-point shooting performance by Tre Jones. Jones came into the game shooting 23.2% from behind the arc, but he made 5-of-7 in this game, as the Hokies sloughed off him in an attempt to clog the lane and slow down Zion Williamson. The rest of the Blue Devils shot just 1-of-13 from the outside, but Jones’s three-pointers were enough to help Duke overcome the absence of Cam Reddish, who sat out the game with a knee injury. Williamson put on a show as usual, dunking three times and blocking three shots. He scored 23 points, right around his season average of 22.5, and like his teammates, he was efficient, making 11-of-14 shots overall. Williamson, Jones (22 points), and RJ Barrett (18) combined to score 63 of Duke’s 75 points and shoot 26-of-45 from the field. The Hokies were led in scoring by Kerry Blackshear with 18 points, Hill with 15, and Robinson with 14. Virginia Tech’s top four scorers, including Bede with ten points, shot 19-of-41, but the rest of the team only went 6-of-21. Outlaw’s stat line was especially brutal: five points on 2-of-7 shooting, with zero rebounds and zero assists in 30 minutes. Alexander-Walker was 3-of-10 from the field (1-of-5 from three) with nine points. Virginia Tech led one key metric, rebounding, 36-30. The Hokies had 17 offensive rebounds, the second highest total of the season (18 vs. Notre Dame), but Virginia Tech was only able to score nine second-chance points off those offensive rebounds. Duke by contrast had only eight offensive rebounds but also scored nine second-chance points. Kerry Blackshear was a monster on the boards, grabbing a game-high 16 rebounds, more than all of his teammates combined (six of Virginia Tech’s 36 rebounds were “team” rebounds). One painful stat for Virginia Tech was points off turnovers, where the Hokies were outscored 17-9, despite both teams having 11 turnovers. Many of Virginia Tech’s turnovers were live-ball turnovers, and they led to Duke outscoring the Hokies 16-7 in fast break points. It was the Hokies’ tenth straight loss to Duke on the road (seven straight) or at neutral sites (three straight). Virginia Tech hasn’t beaten Duke outside Cassell Coliseum since winning 69-67 in overtime in Durham on Jan. 6, 2007. The upcoming offseason will be one of change for Virginia Tech. Robinson, Outlaw, and Hill are all seniors. Alexander-Walker is projected to be a first-round NBA pick, while Blackshear has one year of eligibility left but has already graduated and could decide to move on. Meanwhile, head coach Buzz Williams is heavily rumored to be heading to Texas A&M. Nonetheless, the Hokies stood toe-to-toe with the Blue Devils and impressed a nation watching on television. Capital One Arena, where Virginia Tech fans appeared to outnumber Duke fans, was full and rocking throughout. The Sweet 16 appearance is Tech’s deepest run in the NCAA Tournament since making the final eight in 1967, in a field that only included 23 teams. The three straight NCAA Tournament appearances by the Hokies prove that you can win at Virginia Tech. Interest in the program is at its highest level in almost a decade, and the challenge is to figure out how to keep the program momentum going. One of the most exciting VT sporting events I have been to given the stage. The atmosphere was great with the Hokies well respresented. I thought perhaps Hill thought he had to tip the ball, not shoot it. But he didn’t realize that with 1.1 to go, he could have shot the ball with a shooting motion, not try a tip-in like “shot” which he couldn’t control as well. Dook was in foul trouble big-time, so I liked our chances in OT. But the Hokies had a banner season, ya’ll!!! Looking forward to more excellence – with whatever coach we have, and whatever talent we have. Hokies never say die! I hope the next coach puts an emphasis on shot making and defense. Buzz was always just passing through. He will find out that the SEC is tougher than the ACC. It is about winning championships unless you don’t care about winning championships. Yea. Bc NO coach emphasizes shot making. Great effort, fun following the team this year. All the seniors gave their all. Wherever Buzz goes, I’ll be a fan. He helped resurrect our program. Really thought the first article after this loss would be about Buzz. Expected kind of a dual departure themed article. VT leaves the tourney, Buzz leaves VT. Thank you Buzz Williams, the entire basketball staff and of course our players. What an awesome season! Last night was a fantastic game and I’m glad I was there to see it. I will miss JRob, Med, Outlaw and NAW next year and Buzz (if he goes home to Texas). If Blacksheer returns and our new recruits stay committed along with Kabongo, Nolley, Wilkins and Bede we will have a good season next year. If we get a new coach maybe he will also bring some new talent with him. Hokie basketball is back baby! 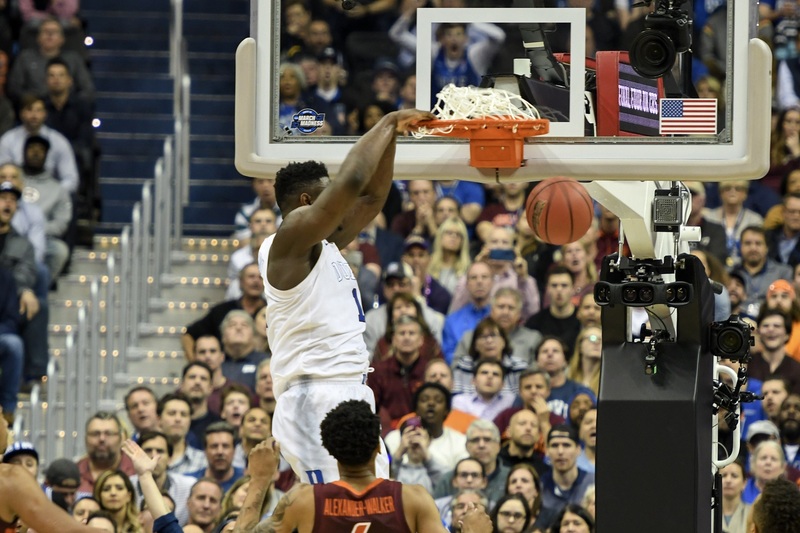 – Zion’s spectacular 1st half block sure looked like goaltending, then and today. Replay shows the arc of the shot was downward. – Williamson threw so many forearms, elbows, and chicken wings that he ought to be endorsing Buffalo Wild Wings. Thanks players, coaches, and staff for a great year! Let’s Go Hokies! Yup Zion should get an offensive foul on almost all of his points inside. But he plays for Duke and duke gets all the calls. I say that it was the dry spell in the second half, where the Hokies took the ball down the floor six times, and got zero points, is what did the Hokies in. and give up 55%. In the 2nd half Duke made a lot of shots driving to the basket. Most of them we looked in decent position but they were just taller and made tough shots over us. Other comments here on NAW were right on – overall he is a great player but was not skilled enough to create his own offense and was not a go-to guy in big game situations. Couldn’t believe Bede’s offensive performance. Gives me hope for next year. Overall, a tremendous season and I am grateful. Even losing Buzz and NAW, if KB returns I think we could be an NIT team next year. I don’t care what anyone says NAW is not ready for the NBA. He has been great at times but at times has handled the ball poorly with many turn overs and taken many bad shots. I’m not a coach but I can easily see this kid isn’t ready to turn professional. Thanks NAW ! It was a great couple of seasons! 1st round pick means he’s one of top 30 players in country. I just don’t see it, if you go through ACC alone …..Duke has 3, uva has 2, FSU has 2, unc has 2 if not 3, that are better and more ready for nba. That’s 9-10. You can’t tell me there aren’t 20 better players throughout the country. Soldiers, we have to hold our head high on this one. Duke was at our Mercy for the final 29seconds after Jones missed the front end of a 1-1. WE had 3 shoots, three time outs to win the game or force overtime and WE just didn’t deliver. I’ll find a way to live that. Despite typical Duke favoritism by the officiating and despite unbelievable dominance from Zion (I hope ATL trades up to get him in this year’s draft) a standing Duke Bench, Coaching Staff, and Team was at OUR mercy just like UCF. I can live with that. What is unfortunate and regretful for me is, I wish Chris Clarke would have made better decisions in the off season. You let us down and would have been an extra difference for this team I think . Lastly, Nickeil Alexander-Walker needs to stay another year my friend. It was “M.I.A” “Where’s Waldo” after your 20pt game against Saint Louis; To go 5 of 18 for 15pts for the next two games doesn’t cut it. The team needed at least an average night’s effort from you…. What happen? Where did you go? Amen to the Hawks getting Zion. With what we already have we would be an instant challenger to win the East. Good article, but I can sense disappointment. Unfortunately, for me, a great season, overcoming the loss of JRob for 12 games, and getting to the Sweet 16 is going to be tainted by another typical Duke victory whereby they get away with more no calls than any team in the country. Is it the fact that everyone feels sorry for an aging coach? Or NCAA wants Zion to play to the end? Yep you guessed it, I’m a tad bitter this morning, cause I think if game was officiated fairly, Zion would have fouled out, or at least sat for a while, and VT would have won. This is why I despise what Duke has become . . . the team that routinely gets preferential treatment, even outside of the ACC. I’m now an official MSU fan. Go Spartans! That is just the way basketball is! That is one of the reasons why I have not watched a game since 1975. I would rather just hear the results. The game moves to fast for the officials to call things correctly. So they have certain standards that they go by. The “best” player almost always gets the calls to go his way. Don’t blame Zion or Duke. Overcoming the officials is part of unseating the champion in basketball. It is just part of the game and a known quantity. Did you see the end of the Kentucky/Wolford game. Poor Wolford had no chance with the officials. But that is part of the game. Kind of the same reason why a better team gets a higher seed. Couple time the officials went to review what they saw or what they didn’t see. After Med took a Zion forearm to the head, the refs watched the replay and still let Zion off. It was not incidental contact to Med’s head. It was a foul. Then Kentucky lost, then unc lost, then Duke lost. All “blue bloods” gone. NO COLLUSION! How bad was it? On a 1-10 scale with 10 being the worst. I’m so proud of this team, Ahmed especially! What a year and the great heart they showed every game earned them national respect. Sure hope this wasn’t Buzz’s last game as our coach, but if it is we owe him a debt of gratitidue for resurrecting the program and renergizing the fans. Been a great. What a great season enabled by a super bunch of seniors and a terrific coaching staff. I wish I could shake hands with all involved and tell them how proud I am of VIRGINIA TECH BASKETBALL. Coach Buzz, should you leave and I expect you will, Thank you for all that you have done for my school and best wishes for you and your family in the future. GO HOKIES!!! Great effort. Just think if we had Chris Clarke and Nolley. Enjoyed the scrappiness of this team all season. Hats off to them. You nailed the difference in the game — Tre Jones. 5-7 from three was unexpected. His first half scoring changed VTs defense in the second half as they couldn’t collapse off him to help as much inside. Then result was Duke getting good looks inside and shooting a high percentage in the second half as a result. Sure it hurt -but what a great ride they’ve given us all season, and for this whole game! Early in the season, when things were going great but they hadn’t started ACC play, I had expressed some caution, saying I’d believe it more when they showed they could compete well in the league. They certainly made me a believer – maybe not quite over the top, but I can’t say they let me down. What more can you ask than 2 chances in the last 10 seconds to take the lead, and then one more with a second left to take it to overtime, against the #1 seed in not only the bracket but the tournament…Sometimes the shots just don’t go down (quite a bit of that in this one) – but how they stuck with it, stayed in it, went after it! Thank you to the entire team for this season and all you’ve done – and I hope the guys that can stick around for next year will stay with us and keep the ship pointed in this great direction. Going to miss our seniors, but geez, Isaiah Wilkins keeps showing these flashes of brilliance, doesn’t he? – and Wabissa Bede came through in a big way, too. Hoping, hoping, hoping that KBJ comes back for next year. Thank you! Someone else believes a decent nucleus could still be there. Add NAW ( I’m in The camp that says stay and improve) Clarke could be back. He’s still in school guys. We could be OK. I get the part about Buzz considering going to Texas, but I don’t get the notion that he was just passing through. You don’t take a chance on coming to Tech and damaging your brand. The dude has two foundations that generate scholarships to Tech. Not saying he’s staying, but everything I’ve heard, he’s very rooted in Blacksburg. Yep, he wasn’t just passing through. He was a difference maker, in a positive sense, in Blacksburg. We will miss him. Great season, one for the history books! We all need to cherish the memories of the season and welcome the next segment of Hokies basketball with optimism and and unwavering support! Thanks Med, 5 and Ty for wonderful careers! Well said. We were fortunate to have some of these guys around for so long.